When we go to stay at friends’ houses, we always take some ‘free from’ provisions. Although you may tell your friends that you are gluten free or dairy free, there’s no guarantee they will understand the problem. And why should they? On one occasion when we had a meal at a friend’s house, they offered Ray (who can’t eat dairy products) vegetables saying “There’s only a little butter on them.” They knew he couldn’t eat dairy products, but thought it was ok because there was only a small amount of butter! We were lucky to be invited to stay with our friends François and Colette in Montpelier, France for a few days. At Costa Coffee, Gatwick Airport, www.costa.co.uk we enjoyed gluten free Cherry Bakewells. These don’t contain dairy products, but strangely are not labelled dairy free. At least we knew we could have breakfast, provided we could buy soya milk. Our friends were wonderful and took us to a special health food shop Bio & Sens in Juvignac www.bioetsens.net opposite the main supermarket Intermarché. It is stocked with all manner of gluten free and dairy free foods as well as health foods. So we bought some biscuits and gluten free Schar bread www.schar.com/glutenfree. Inside we found Bjorg soya milk www.bjorg.fr which we’d sampled before in France. We find you have to be careful when selecting soya milk as some brands not only taste awful but break up when mixed with hot drinks. We were impressed to see an array of free from foods on display including pasta. That evening Colette cooked us a delicious meal of grilled salmon, potatoes and salad. At breakfast I had gluten free cereal with fruit, soya milk and soya yogurt, while Ray enjoyed a bowl of muesli. He was able to eat the French baton bread, so toasted it and ate it with honey. 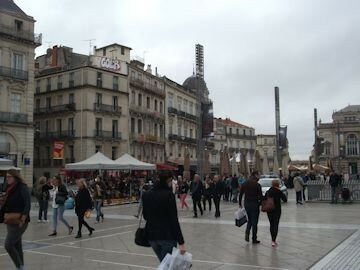 In Montpelier, we browsed round the shops in the Polygone shopping centre www.polygone.com . 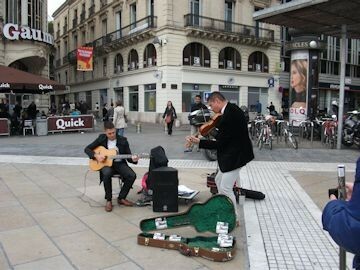 In the main square, the Place de la Comedie, we listened to two musicians playing music in the style of Django Reinhardt, gypsy jazz or “hot club de Paris”. 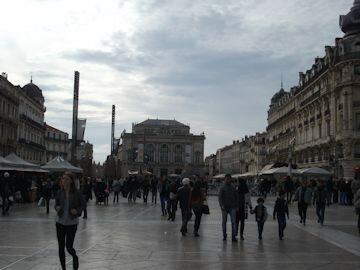 The Place de la Comedie is the heart of Montpelier, where you’ll find the 18th century opera house alongside lively alfresco cafes. Behind the Place de la Comedie are a multitude of streets and alleys, which make up the old town, called the Ecusson, which we explored by foot. Even though we were with our French friends, we still had a piece of paper explaining our allergies in French to show waiting staff at restaurants. For me, “Je dois allergies au gluten et le blé” (I am allergic to gluten and wheat) and for Ray, “Je suis allergique aux produits laitiers – lait, beurre, fromage” (I am allergic to dairy products – milk, butter, cheese) We still found this useful. Sometimes when we show it to a waiter, they read it several times as if it is something outside their experience. 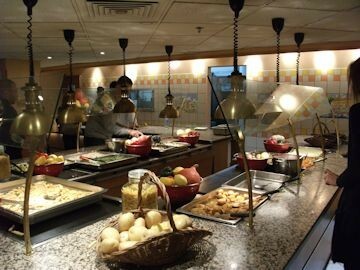 The Flunch restaurant in Montpelier’s Polygone shopping centre http://restaurant.flunch.fr/montpellier/flunch-montpellier-le-polygone/ is one of our favourites as it has a buffet-style salad bar and cold meats. For the hot food, you choose from the pictures on display. 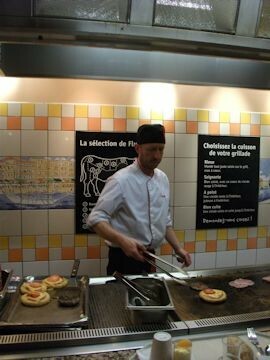 Ray asked for grilled ham, French fries and salad (5.50 euros). We checked that there was no dairy; the ham is grilled with oil. When you have paid for the hot meal, you are given a receipt and then queue for your meal. When it’s your turn, you can watch your meat being cooked in front of you. You then help yourself to vegetables and French fries. 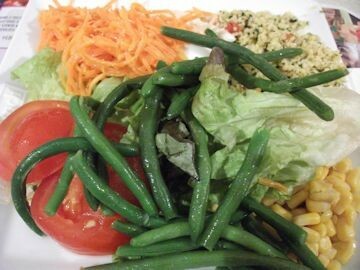 I enjoyed salad with sweetcorn, tomatoes, chopped carrots and lettuce (4.95 euros). It’s a popular restaurant so we had to search for seats. Quick, easy and affordable – Flunch works well for us. Montpelier boasts some fascinating independent shops such as Pomme De Reinett, Rue de l’aiguillerie www.tradition-jouet.com a warren-like toy shop selling all sorts of toys from teddies and tin toys, all beautifully displayed. Or there’s Images De Demain, Rue de la Vieille, +33 4 67 66 23 45 offering a vast selection of picture postcards, prints cards and gifts. 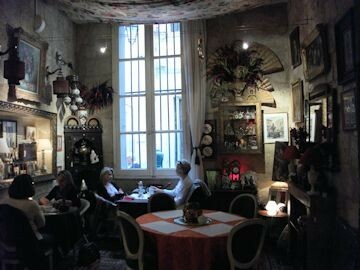 Later that afternoon, we relaxed at L’Heure Bleu tea salon, 1 Rue de la Carbonnerie, tel: +33 4 67 66 41 05 with its “objets de qualité” – an astonishing array of paintings, ornaments and bric a brac, all for sale. It offers an impressive menu of teas with fabulous names such as Secret Moon, Rose d’Hiver, Lady in Red and Good Feeling, as well as a choice of hot chocolate. Oddly, François was unable to have hot chocolate because the staff member who makes it was at lunch. We all opted for the Jasmin bio tea, beautiful served in a teapot (4.80 euros per person). That evening, we went to the Utopia cinema, 5 Avene Du Docteur, Pezet 34090 Montpelier, www.cinemas-utopia.org tel: +33 4 67 52 32 00. This is more like going inside a private house. It is reminiscent of the Everyman cinema in Walton-on-Thames, Surrey www.everymancinema.com as it is a small, intimate cinema with very comfortable seating. We saw the film “Youth” starring Michael Caine and Harvey Keitel – brilliant. Do see it if you can. In Sete, we visited Pointe Courte, a typical old fishing village, very picturesque, with plenty of ducks. 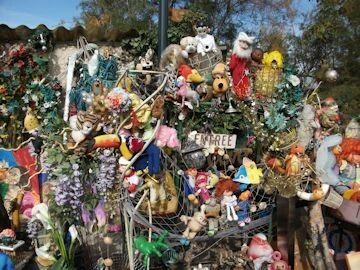 We found unusual decorations outside one of the houses of soft toys, tinsel and netting. 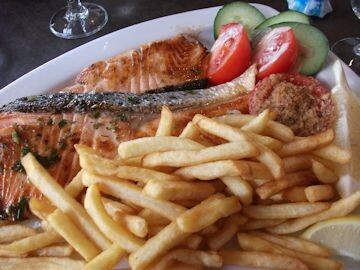 Lunch was at Le Petit Pescher , 12 Quai General, Durand http://www.restaurant-sete.com/ where we both enjoyed grilled salmon, French fries and salad. We did check with the waiter that the fish was cooked in oil, not butter. Later in the afternoon, we visited Tabary’s Café, 1 Grand Rue Maris, Roustan, 34200 Sete, tel: +44 3 67 74 3907, where the only black tea was Russian and although it smelt strange, it tasted fine. In Arles, our friend Colette took us to Hotel le Calendal, Rue Porte de Laure www.lecalendal.com initially for tea, where we sat outside in the sunshine, admiring part of the famous amphitheatre, which dominates the city. The Roman Amphitheatre is the largest and best preserved ancient monument in Arles, dating back to the first century AD. The arena was one of the largest in Gaul and could accommodate 21,000 spectators. It is currently undergoing major restoration, although visitors can still look round. For lunch, we returned to Hotel La Calendal and sat in its tranquil garden at the back. 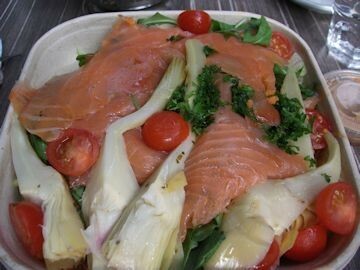 Here, both Ray and I enjoyed smoked salmon salad with artichoke, tomatoes and lettuce (7.50 euros). 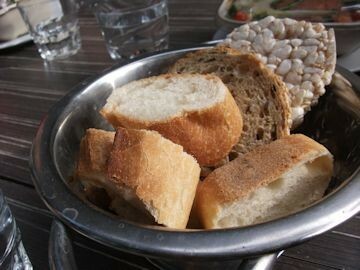 Happily the bread basket also contained rice cakes which I could eat. We discovered some fascinating independent shops, although not many were open. 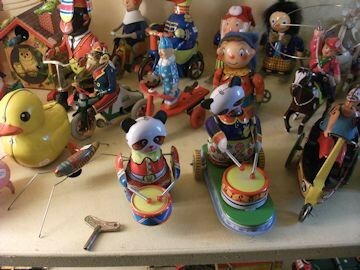 These included Farfantello, 32 Rue de La Liberte, Arles, www.facebook.com/farfantello.arles tel: +44 3 04 90 96 15 87 selling retro toys, ornaments and children’s clothing. Well worth a visit. Also the Puyricard chocolate shop www.puyricard.fr where you can buy a small box of artisan chocolates for about 11 euros. It also runs chocolate making workshops. Sounds good to me!